Posted in: Art, Music, Photography. Tagged: Etienne Aubry, French, Jean-Jacques Rousseau, Mother and Child Reunion, Nelson-Atkins Museum of Art, Oil on canvas, Paul Simon, The First Lesson of Fraternal Friendship, wet nurse. 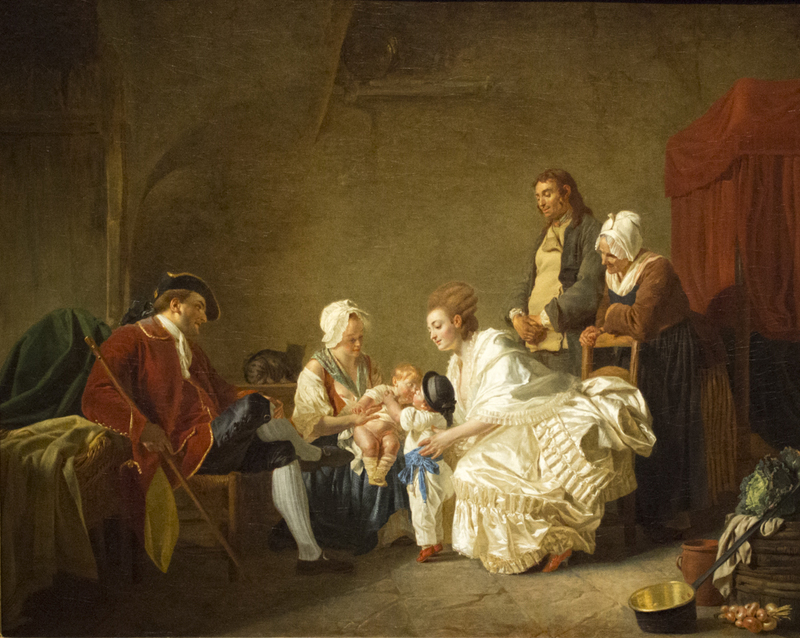 'In a rustic interior are six figures, representing a family of the upper classes (father at left, mother third from right, older son in black bonnet, white shirt and pants, blue sash) paying a visit to their youngest son, in the care of a wet nurse. The two brothers kiss; at right, a young male peasant and an old woman survey the scene. At right is a covered bed, in right foreground is still life of brass pot, ceramic jar, onions, and cabbage. I have known about the wet nursing and being a mother myself, I condone this practice. Unless it threatens the health of the mother or the child in any way, I don’t see a reason for devoiding a child from his birthright. I think if possible it’s infinitely better for the child to nurse. This is a sweet subject, the bonding of siblings! I just love it. Wow! This picture truly tells the story of its time!